I wanted to write about this cake, which I made, in close succession, once for Louise’s first birthday, again to take these pictures, and another time in between. It is fiendishly good. It also seems to be the object of a small controversy. I found this cake on Lottie + Doof and it looked perfectly irresistible. But one small thing irked me about the recipe; the fact that it contains almond extract but no almonds, which feels like cheating, just a little bit. So I thought about adding almonds. I was slightly worried about the fluffiness factor so alluringly portrayed, so, standing there, in front of my ingredients, I pondered – a good five minutes – whether I should substitute some of the flour with ground almonds, or not. I decided yes. And barely half a minute later, I read the blog author’s response to a comment on his poppy seed cake post: “My recommendation would be to try the original before adding almond meal. The texture is what makes this so special, and the meal will change that.” I very nearly threw away my mix of almonds and flour. But I didn’t. My cake, though undoubtedly much denser than the original, was also completely delicious. The second time I made the cake I used no flour at all. Thomas insists it is the better version. I (respectfully) disagree. Without flour it is too grainy and buttery. This observation should of course be a hint that the initial version is in fact truly the best. Possibly. But I like dense cakes. Plus, the recipe without almonds can already be found in at least two places. I stand by this one. Bring 1/2 cup (filtered) water to boil in a small saucepan, remove from heat, stir in the poppy seeds, cover, and let stand for 1 hour. 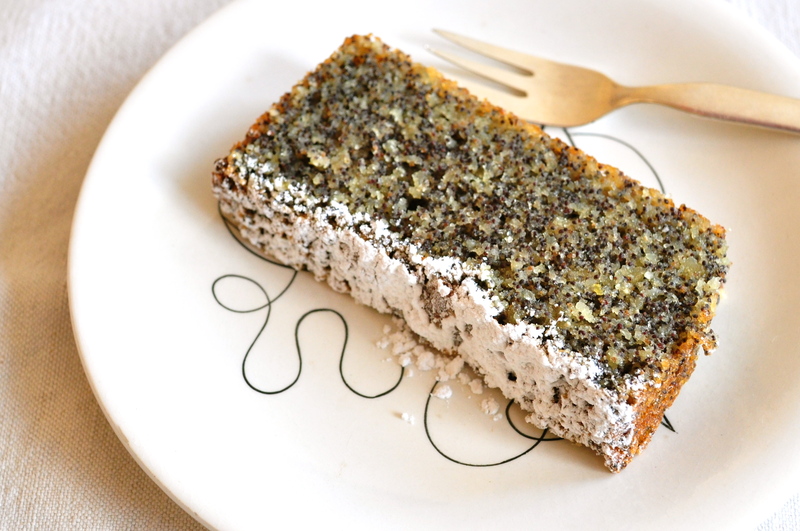 In a food processor, pulse grind the poppy seeds until lightly crushed. 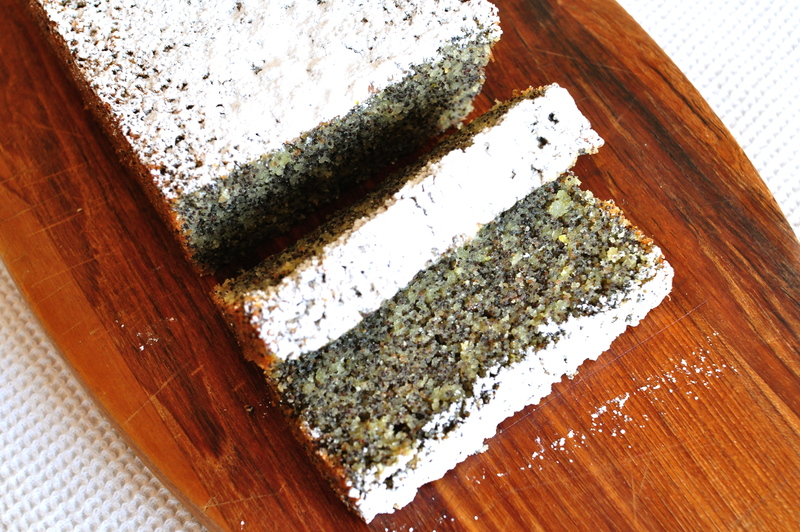 Remove poppy seeds and set aside. Pulse chop the almonds until finely ground. Preheat oven to 350°F (175°C). Line a 10 x 5″ (25 x 13 cm) baking pan with parchment paper and butter the paper generously. In a small bowl, mix the flour, almonds, baking powder, and salt. In a large bowl, beat the (softened) butter and sugar until light and fluffy. Add the poppy seeds until well combined. Then add the eggs, one at a time, beating well to incorporate each time. Add the vanilla extract, almond extract, and lemon zest. Then gently stir in the almond/flour mixture until just combined. Pour the batter into the prepared pan. Bake for 40 to 45 minutes, until a skewer or toothpick inserted in the center of the cake comes out clean. Let the cake cool completely. Dust with powdered sugar through a fine mesh sieve before serving. *The lemon zest should be just enough to make the flavors pop without giving a lemony taste. This entry was posted on 4 April 2011 at 18:18 and is filed under Dessert, Year-round. You can follow any responses to this entry through the RSS 2.0 feed. You can skip to the end and leave a response. Pinging is currently not allowed. That was unintentional – thank you very much for pointing it out, I have corrected the recipe. 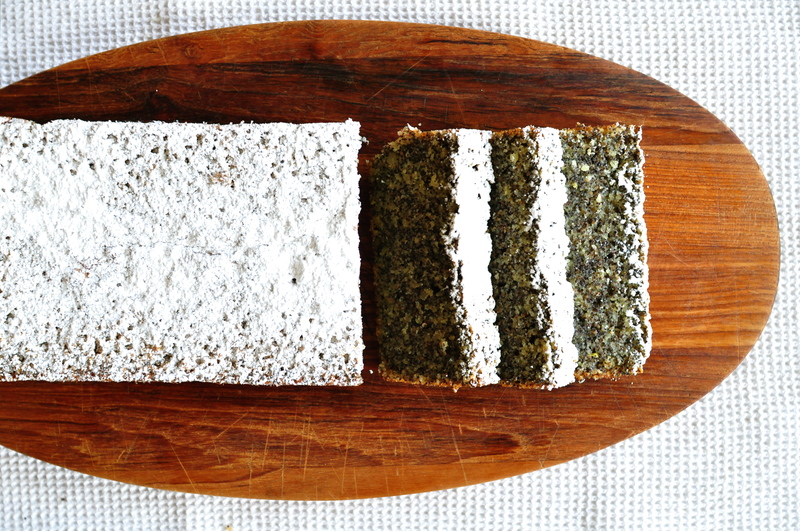 I love all cakes, cookies, and pastries with poppy seeds, your mom’s rolls sound great! Thanks for the comment. I am revisiting this recipe as I had an amazing version of it at a Riverford cooking (and eating!) event this past week. The recipe seems to be the same as yours — only almond meal though — but the batter was poured over cherries, and topped with a little bit of pouring cream when served. There are no words to describe how good it was. I am going to try it with rhubbarb this weekend. This sounds incredible. Will keep it in mind for next year’s cherries (or if I get my hands on some rhubarb…). Question: I assume when you say no flour (in the version Thomas likes) you used all almond flour? This would make a version that is friendly to celiacs, would it not? I know (and like to invite over) a surprising number of people with intolerance to flour. Looks yummy! Maybe Casper will follow Louise in his first birthday cake. Yes, I used 1 1/2 cups (200 g) ground almonds and no flour. It really did turn out very nicely and is an excellent no flour cake option! Looks delicious + no flour = can’t wait to try it! Actually I’ll probably convince Claudia to try it, considering my rather shoddy baking skills. Thank you – it looks delicious! Thank you! And nice idea of a collective cookbook. I will check it out.